… than messin’ ‘bout in Classic Yachts? 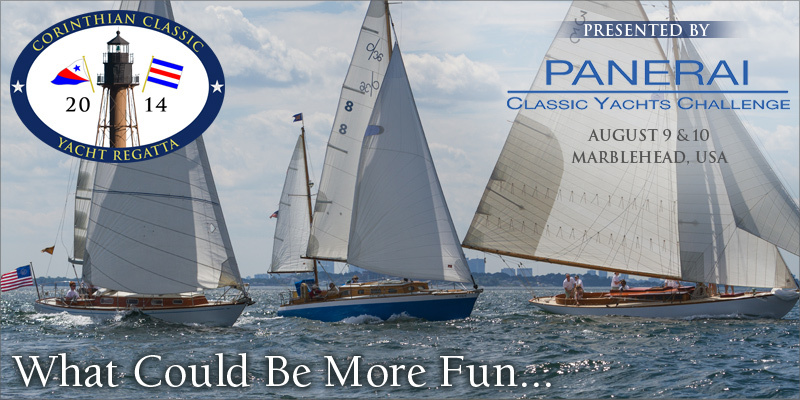 The Corinthian Classic Yacht Regatta presented by Officine Panerai (www.panerai.com), August 9 & 10. Sure, sailing your boat at maximum efficiency and a good turn of speed is good for the soul, but why not have more fun by sailing with other classics? The Corinthian Classic Yacht Regatta provides you with that opportunity and plenty of F-U-N! This is just as much a rendezvous of classic yachts and “characters” as it is a well-organized regatta. Last year we had over 50 boats participate and we’re tweaking the “fun factor” up a bit for 2014. This regatta is a blast! Easy to sail. Long reaching legs. Beats will be minimal (Gentlemen do not beat). NO Spinnakers. The season is short. Plan on having some real fun this summer by registering to be a part of the Corinthian Classic August 9 & 10. Start planning now. Instructions to enter can be found on our website at www.corinthianclassic.org.